This is our most popular First Aid course and covers the requirements of all the National Governing Body Award schemes such as Mountain Leader (ML), Mountain Instructor Award (MIA), Mountain Instructor Certificate (MIC), Single Pitch Award (SPA), British Canoe Union, Mountain Biking etc. 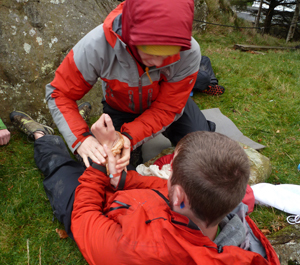 The course is aimed at any Outdoor professional or enthusiast and focuses on what first aid to do in an emergency where quick help is not an option. This course can be tailored for specific needs. An extra day can be added if you require, allowing the first aid course to focus more specifically on mountain or water environments in greater detail. - Emergency Procedure: DRS ABCDE. - Protecting the Airway; Safe Airway Position. - Basic Life Support and CPR. Internal and external, minor and catastrophic. - Life threatening injuries: chest injuries. Asthma, heart attack, angina, epilepsy, diabetes, anaphylaxis. Ticks & Lyme disease, Weils disease, weaver fish, jellyfish stings, adder bites. - Sprains, strains, fractures and dislocations. Hypothermia, hyperthermia, heat and cold related conditions. £1200 for a group of up to 12. (venue may cost extra as will transport and accommodation costs). You will receive a certificate which qualifies you for 3 years.